The telephone has been an incredibly important tool for businesses, since its inception. With each new development in telephone technology, new applications for business use arise. One of the most important options offered by telephone service providers is the 800 number or toll-free number. It allows customers to make a call to your business at no charge to them. Offering a toll-free number increases the likelihood that a potential customer will pick up the phone to at least ask questions, so the door is then open for your sales staff to close the sale. Originally introduced to help reduce the need for telephone operator assistance and as a collect call alternative, toll free numbers caught on with businesses and continue to grow in popularity even today. In fact, many businesses have multiple toll-free numbers and use them to track the effectiveness of marketing campaigns. This high demand created a shortage of 800 number combinations, which led to the adoption of 888, 877 and other prefixes. Today there are fewer than 10% of the possible combinations for 800 numbers available, and they are available only through specialty telephone number providers. However, a variety of other providers can bring you toll free numbers with the newer prefixes. 1967 – Toll-free 800 numbers were offered to big businesses. 1986 – Vanity numbers began, thanks to Pacific Bell. 1993 – Toll free numbers became portable thanks to the FCC, which meant they could be transferred if the company switched telephone carriers. 1996 – Toll-free 888 numbers became available, as 800 number availability dwindled. 1998 – Toll-free 877 numbers were introduced. 2000 – Toll-free 866 numbers were introduced. 2010– Toll-free 855 numbers were introduced. 2013– Toll-free 844 numbers were introduced. A great branding strategy is to choose a toll free vanity or mnemonic phone number. Essentially this means that the numbers in the phone number spell out a word, phrase or name. It is powerful in that it is much easier for customers to remember than a random string of numbers. Typically businesses choose to use the name of their business, a product name, or simply what they offer. A good example is 1-800- FLOWERS, as it leaves little debate as to what you will get by calling that number. Enterprising businesses who hold very generic toll free numbers, like 1-800-TAXICAB, rent the line to different companies in other cities. This is lucrative for the company holding the line, and advantageous for the local business who gets the benefit of having an easy-to-remember toll free number. 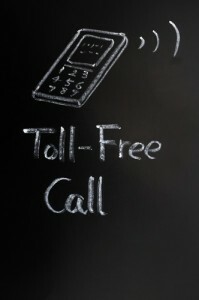 Originally it was very costly for a business to have a toll-free number, because there was a fixed rate for the line. Even after technology improved and companies with the lines were charged per call, the price was still high. However, as these numbers became available from a variety of phone service providers, the cost became greatly reduced. Today, with virtual phone service providers like Halloo, you can get a toll-free number that includes an online customer management system and more, for a minimal cost per month. If you don’t already have a toll-free number for your small business, embrace the opportunity and get one today. You’ll soon see the power of a free call, with increased inbound callers. This entry was posted in Marketing, Toll Free Numbers by daniel. Bookmark the permalink.